* Minimum of 10 bundles per order. Includes kit shirts, shorts and socks in price. Moisture wicking technical fabric to ensure a cool and comfortable fit. Kit available in a range of collar designs. Kit available in long or short sleeve. 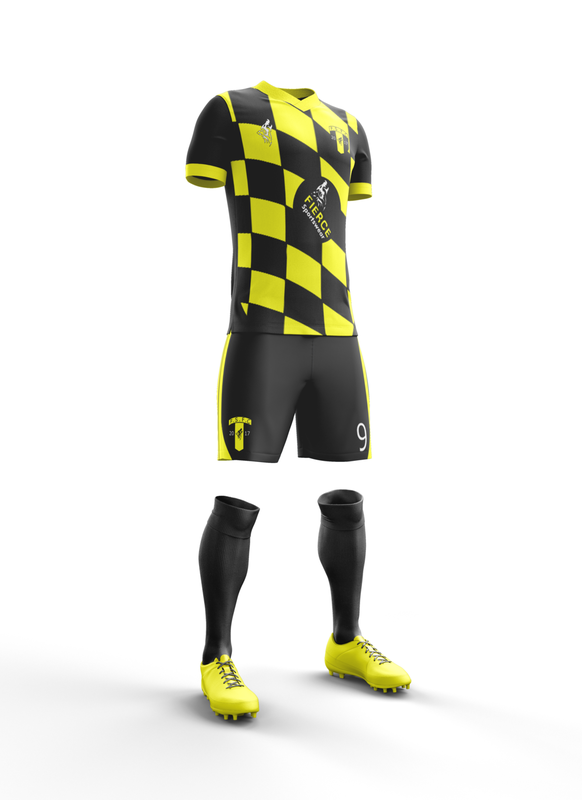 Free artwork/design of kit in team colours. Team badge on all kit shirts, shorts and training jumpers. Numbers on all kit shirts and shorts. Sponsor logo artwork on all kit shirts. Free artwork/design of training jumper in chosen colours. Player initials on all training jumpers. Delivered to your door - READY TO WEAR! * Must be ordered with Outfield Kit + Jumper bundle. Padding for kit available at extra cost. Team badge on all kit shirts, shorts and tracksuit tops. Rib knit cuff and hem on tracksuit top. Free artwork/design of tracksuit in chosen colours. Team badge on all tracksuit tops. Player initials on all tracksuit tops. * Must be ordered with Outfield Kit + Tracksuit bundle. To order just request a FREE FIERCE e-Catalogue below and receive your full team colours product list. If you don't like the first design let us know your thoughts and we will keep going till we get the perfect Team Bundle for you! * There is no limit to the amount of e-Catalogues a customer can have.